Anubis, the Egyptian god of the dead, has joined the ever-growing population of deathly artworks at the Denver International Airport (DIA). Denver’s local ABC affiliate, KMGH, reports that horrified travelers are now greeted by the 26-foot tall statue upon arrival in the main terminal. Anubis is being erected in anticipation of the Denver Art Museum’s upcoming King Tut exhibit. 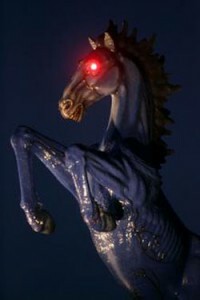 The jackal-headed god now joins Mustang, also known as the “Bluecifer” or “Demon Horse” statue by Luis Jimenez and Leo Tanguma’s Nazi-inspired two part mural entitled Children of the World Dream Peace. 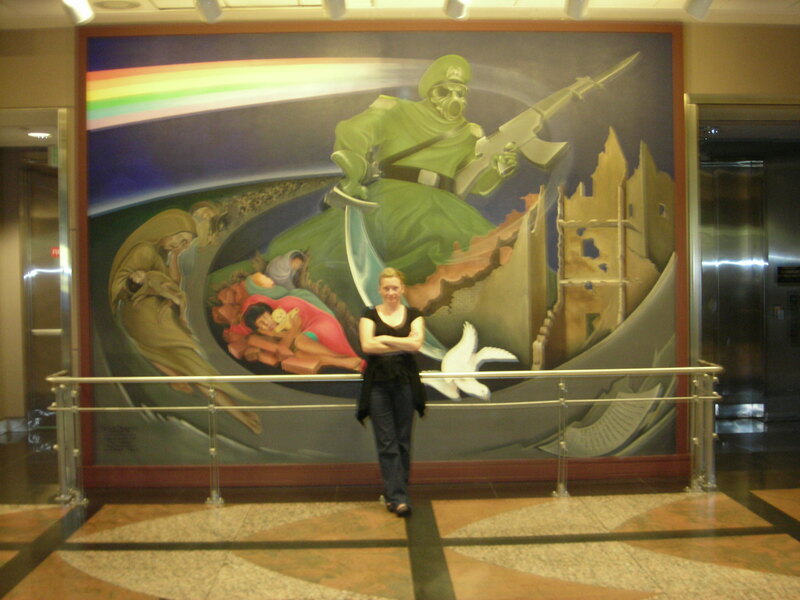 DIA has garnered much praise and criticism over the years for its extensive public art program which has featured a wide variety of paintings, murals and sculptures, in addition to various commemorative plaques and parquetry. Children of the World Dream Peace has probably garnered the most attention, inspiring multiple conspiracy theories about its message and meanings. With its gun-wielding, sword-brandishing, gas-masked soldier figure, you may be able to see why. The giant blue mustang with the glowing red eyes and popping black veins has also struck fear into the hearts of travelers—although more for its ominous presence—than any overtly death-inspired message. Although, the fact that the artist, Luis Jimenez, DIED from being crushed under the sculpture when it fell on him, may also add to the creep-out factor. Anubis is the greek version of his name. The Egyptians knew him as Anpu (or Inpu). Anubis was an extremely ancient deity whose name appears in the oldest mastabas of the Old Kingdom and the Pyramid Texts as a guardian and protector of the dead. He was originally a god of the underworld, but became associated specifically with the embalming process and funeral rites. His name is from the same root as the word for a royal child, “inpu”. However, it is also closely related to the word “inp” which means “to decay”, and one versions of his name (Inp or Anp) more closely resembles that word. As a result it is possible that his name changed slightly once he was adopted as the son of the King, Osiris. He was known as “Imy-ut” (“He Who is In the Place of Embalming”), “nub-tA-djser” (“lord of the scared land”). The interpretation and criticism of art is a heady business. Assigning meaning is never cut and dried—even when the artist him/herself explains the creation. Despite observations by sanctioned or unappointed art critics, we are all ultimately left to our own devices in this process. Much as in death, it’s a solo trip. So if you have visited or will visit the DIA and have any extreme feelings one way or another about their art collection and its possible deathly implications, drop us a line and give us your insights. Posted by Kim in Afterlife, Death + Art / Architecture, Death + Popular Culture and tagged public art, religion. Bookmark the permalink.